Breed Color(s):Puppies are born black, but lighten to the final adult wheaten color by about two years of age. The Soft Coated Wheaten terrier came into existent in Ireland. This particular breed of dogs, are commonly used by farmers for their work, like guarding and protecting sheep and cattle. They are also used as hunting dogs, they have the capability to hunt in water and on land. This breed is very intelligent and brave they are very alert and can protect their family from strangers. The Soft Coated Wheaten Terrier is medium in size and possesses lots of powers they have the basic and core attributes which a terrier has. This breed of dog can be used as a family dogs they possess such attributes, which make them good housedogs. They do well with children and adults and are ok with other pets and small animals. They are very sensitive and like to be with their owners, they can become destructive, if they are left alone for some extent of time. This breed of dog has single coat, that is soft, silky and wavy. Their coat can change as per their age, Puppies are born black, but at maturation the coat ranges from gold to reddish-gold to silver. This breed is low shedding. This breed of dog is independent and needs dominent owner they are good learners. The training should be given to them with fairness and patience they will not respond to any hard and harsh methods of training. This breed of dog requires early age socialization and obedience training, so they become obedient and behave well. This breed of dog is energetic and athletic, they love to go for long walks and enjoy the family play session. They will do well in apartment, if they are provided with sufficient exercise. The soft Coated Wheaten Terrier is a high preservation breed which requires, daily brushing to avoid dirt and dead hair the bathing should be given to them, when its required, with a dry shampoo, it is mandatory to check their ear and eyes regularly, to avoid infection. 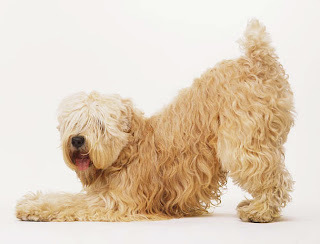 The Soft Coated Wheaten Terrier is prone to flea allergies, Addison's disease, PLN, and PLE. They do not do well in hot climates.